The 12th Amendment is about choosing the President and Vice-President. Summary: The 12th Amendment was ratified in 1804, during the administration of Thomas Jefferson, and changed Presidential election rules, applying to both the President and the Vice President. When was the 12th Amendment passed? The XII Amendment was passed by Congress on December 9, 1803 and ratified June 15, 1804. 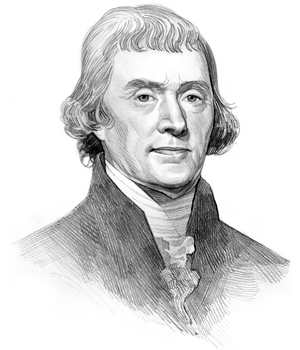 Thomas Jefferson was the 3rd President of the United States whose presidency spanned from March 4, 1801 to March 4, 1809. One of the key events during his presidency was the ratification of the 12th Amendment to the Constitution. The cause or reason for this addition to the Constitution was because there had been considerable confusion during the 1800 election process which needed clarification. "The Electors shall meet in their respective states and vote by ballot for President and Vice-President, one of whom, at least, shall not be an inhabitant of the same state with themselves; they shall name in their ballots the person voted for as President, and in distinct ballots the person voted for as Vice-President, and they shall make distinct lists of all persons voted for as President, and of all persons voted for as Vice-President, and of the number of votes for each, which lists they shall sign and certify, and transmit sealed to the seat of the government of the United States, directed to the President of the Senate..."
"...the President of the Senate shall, in the presence of the Senate and House of Representatives, open all the certificates and the votes shall then be counted..."
"... The person having the greatest number of votes for President, shall be the President, if such number be a majority of the whole number of Electors appointed; and if no person have such majority, then from the persons having the highest numbers not exceeding three on the list of those voted for as President, the House of Representatives shall choose immediately, by ballot, the President. But in choosing the President, the votes shall be taken by states, the representation from each state having one vote; a quorum for this purpose shall consist of a member or members from two-thirds of the states, and a majority of all the states shall be necessary to a choice. And if the House of Representatives shall not choose a President whenever the right of choice shall devolve upon them, before the fourth day of March next following, then the Vice-President shall act as President, as in case of the death or other constitutional disability of the President..."
N.B. The word 'quorum' means the smallest number of members necessary at a meeting before any business can be done. "...The person having the greatest number of votes as Vice-President, shall be the Vice-President, if such number be a majority of the whole number of Electors appointed, and if no person have a majority, then from the two highest numbers on the list, the Senate shall choose the Vice-President; a quorum for the purpose shall consist of two-thirds of the whole number of Senators, and a majority of the whole number shall be necessary to a choice. But no person constitutionally ineligible to the office of President shall be eligible to that of Vice-President of the United States." Meaning: This paragraph relates to the rules for choosing and voting for the Vice President and he role of the electors and Senators. The original full text of the 12th Amendment of the Constitution is as follows. Note: A portion of Article II, section 1 of the Constitution was superseded by the 12th amendment. The Electors shall meet in their respective states and vote by ballot for President and Vice-President, one of whom, at least, shall not be an inhabitant of the same state with themselves; they shall name in their ballots the person voted for as President, and in distinct ballots the person voted for as Vice-President, and they shall make distinct lists of all persons voted for as President, and of all persons voted for as Vice-President, and of the number of votes for each, which lists they shall sign and certify, and transmit sealed to the seat of the government of the United States, directed to the President of the Senate; -- the President of the Senate shall, in the presence of the Senate and House of Representatives, open all the certificates and the votes shall then be counted; -- The person having the greatest number of votes for President, shall be the President, if such number be a majority of the whole number of Electors appointed; and if no person have such majority, then from the persons having the highest numbers not exceeding three on the list of those voted for as President, the House of Representatives shall choose immediately, by ballot, the President. But in choosing the President, the votes shall be taken by states, the representation from each state having one vote; a quorum for this purpose shall consist of a member or members from two-thirds of the states, and a majority of all the states shall be necessary to a choice. ***And if the House of Representatives shall not choose a President whenever the right of choice shall devolve upon them, before the fourth day of March next following, then the Vice-President shall act as President, as in case of the death or other constitutional disability of the President***. ***Superseded by Section 3 of the 20th amendment. The above information provides the text, definition and summary of the amendment. The following video will give you additional important facts and dates about both the personal life and political life of the 3rd President of the United States whose presidency spanned from March 4, 1801 to March 4, 1809.